Pink Glitter 'Vs' Purple Glitter = Purple got the most votes (here). So here is the tutorial....finally! I apologize for the delay. This is the 2nd time I did this pictorial - because I didn't like the first one too much & also, I kept searching for my Inglot Duraline to use with the glitter, hoping I'd find it, only to realize I'd sold it off in a Blog Sale! So I had to go old school, so as not to delay it any further. 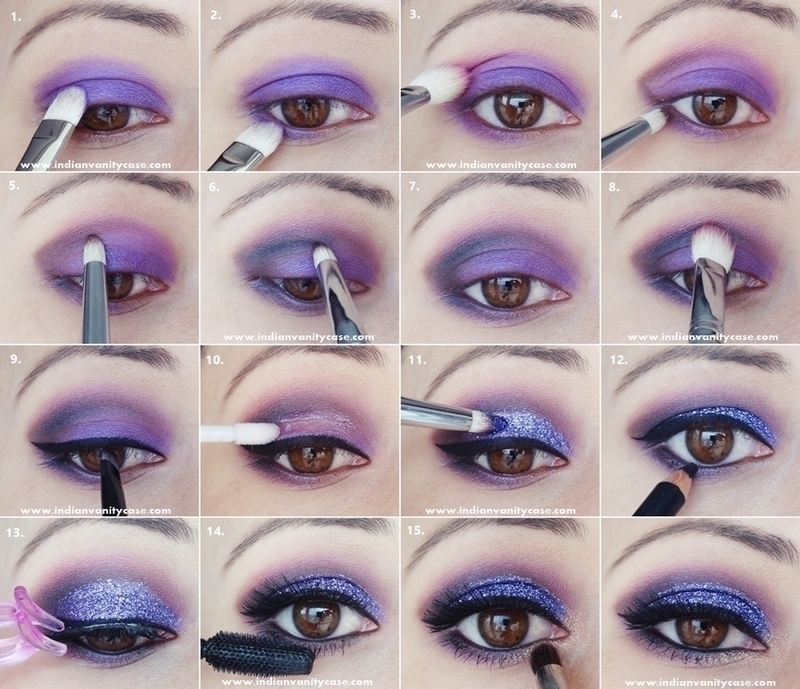 STEP 1: After priming lids with an eyeshadow primer, apply purple eyeshadow on lids up to your crease line. STEP 2: Also apply purple e/s on outer half of lower lash line. STEP 3: Take some pink e/s on a blending brush, and sweep it along the edges of the purple e/s in a window wiper motion. Run the brush along the purple line on lower lash line as well. Blending tutorial here. STEP 4: With a pointy pencil brush, apply a brown e/s on the outer V of upper lid. STEP 5: Shade inside the V. Take more brown e/s to intensify the color. STEP 6: With the same pencil brush, take a lilttle bit of matte black e/s, and make a V along the inner edges of the previous brown e/s. Just a little to define the crease line a little bit more (especially if you don't have a deep crease line), coz we don't black to overpower the other colors. STEP 7: It should look something like that. STEP 8: Blend them all together with the pink e/s, like in STEP 3. take the brush all the way to the inner corner of the eye. STEP 11: With a small brush, pat glitter gently over the glue/lip gloss. Do not drag your brush, just press the brush to deliver the glitter on to lids. Layer glitter until area is fully covered. Don't worry if it gets on your liner, coz you can always go back and retouch the areas afterwards. *Purple glitter appears bluer than it is in photos, coz that's the problem with reflective purple! STEP 12: Line waterline & tightline inner rims of upper lash line with black kohl pencil or kajal. STEP 13: OPTIONAL ~ Apply false lashes. STEP 14: Apply mascara on lower lash line & also the top lashes so they blend with the falsies. STEP 15: Last step! Highlight inner tear duct corners with a shimmery e/s, like rose gold. Bring it to about 1/3rd of lower lash line. *You can also apply a matte cream e/s on your brow bone to clean it up if needed. Highlight ~ Organza & Gateau from Sleek Oh So Special Palette + a little bit of gold from Naked 3 Palette. Brushes ~ MAC 239 Eye Shader Brush for purple e/s, Sigma E25 Blending Brush for pink e/s & blending, Sigma E30 Pencil Blush for crease, Inglot 80HP/S for highlight, MAC 217 Blending Brush to clean up brow bone. This eye makeup looks sooo gorgeous, especially during night time. You should definitely try it out for special occasions or clubbing. The pictures here don't do justice to it, coz the purple glitter doesn't look as purple as it should look. You can do this technique with any other colors. If you use only neutral colors, you got yourself an everyday wearable look. I hope you liked this tut & picked up some tips. Do let me know what other tutorials you'd like me to do next. Dying To See Your Full Face Makeup! I Mostly Use Gold or Bronze Glitter But Even This Looks So Wearable..All Thanks To You! SOoo beautiful! I've really really missed your tutorials like this, the fun bright ones! I feel like i haven't seen one in forever! Thank you! Thanks for sharing this tutorial. So this is how to create this glittery look. I will def gonna try this out. woah! <3 loved it soo much!